Daily Potholders. More cats in the future. I track potholder sales much more closely than I follow the stock market. The potholders matter to me, whereas I have nothing of value in the stock market, or any other market. My remaining IRA would cover a weekend in New York City. I am rich in other ways, and I have no notions of ever retiring anyway. I might end up helping Maria make potholders. She is trawling for more vintage cat fabric, as the cat potholders she mailed flew out of her studio. She has all kinds of ideas for limited edition and other theme potholders, which she can describe for herself on her website. The potholders are a compelling evolution and lesson in creative marketing. The idea of inexpensive, utilitarian art worked from the beginning. 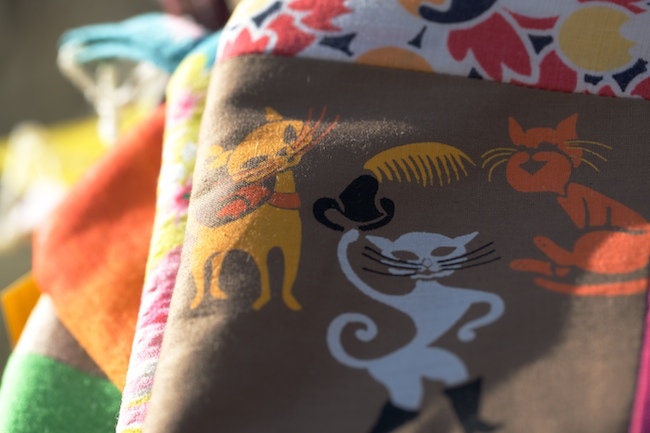 Then, as the potholders have assumed different meanings and personality – some made from the fabrics of loved ones, others representing themses like cats – they have evolved further. And are evolving still. Maria even has notecards and shipping labels now. A far cry from the early potholder days.